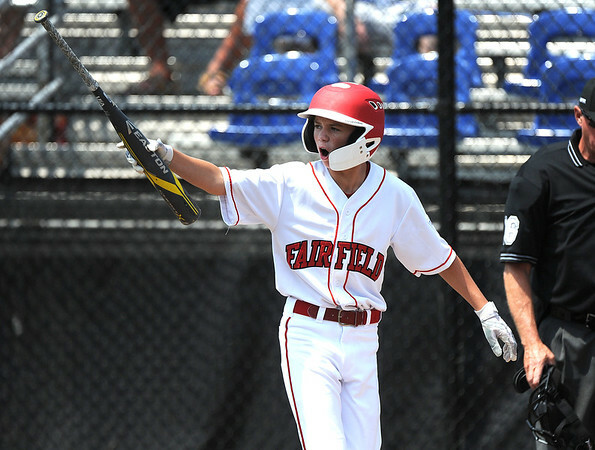 BRISTOL - Connecticut jumped ahead early and never looked back on Tuesday afternoon, as Fairfield American coasted to a 7-1 victory over Maine at the Giamatti Little League Center to stay alive in the New England Regional. Connecticut jumped out to an early 3-0 lead after two innings with RBI hits from Pierce Cowles and Timmy Domizio, as well as a wild pitch that scored Eli Balkan. Connecticut manager Jeff Gouley thought the hot start was key, especially after falling 10-0 to Rhode Island on Sunday. But the biggest hit of the game came in the third inning off the bat of Dustin Walters. As a pinch hitter, Walters took the second pitch of the at-bat and sent it far into the trees in left-center field. It was a two-run homer for a 5-0 Connecticut lead. Another play Gouley said was crucial was Jon Morris’ RBI triple in the fifth inning after a nine-pitch at-bat. Will Meyers came up big on the mound for Connecticut. He needed 67 pitches to get through four innings, giving up just three hits and one walk while striking out six batters. Meyers got plenty of help from the defense behind him. Along with playing error-free ball, the Connecticut defense made great plays throughout the game to take away hits from Maine. Dimizio, Myers’ battery-mate, also received praise from Gouley after the game for his efforts behind the plate on a day where the teams were dealing with 90 degree-plus temperatures. Connecticut has a day off before hitting the field again on Thursday against either New Hampshire or Vermont. There are still three wins between Fairfield and the regional championship. Posted in The Bristol Press, General Sports on Tuesday, 7 August 2018 20:46. Updated: Tuesday, 7 August 2018 20:49.